The spectrum grow light have useful wave-length,which can be fully absorbed by plants pho-tosynthesis. Full spectrum ensures the light emit more uniform light for plants growing which is beneficail for all stages for plant grow. 1.This New COB LED Grow Light with new technology of Flip Chip Process, withstand high temperatures up to 120 degrees Celsius, more steady than the ordinary LED chip, Not burn. 2.Highest Performance Price Ratio, Save Your Money. Each COB can reach wall draw power 50watts, full spectrum, suitable for plant all stage growing. Special for Blooming stage. Speed Up the Growth, Get higher Yield. Can replace the traditional 300W RED&BLUE led grow light. 3.No noise with fan for cooling, air aluminum case with special heat dissipation coating, less than 65 degrees Celsius, it can work continuously for 24 hours per day. 4. Intelligent Control of Heat Dissipation IC inside, don't worry the temperature going up higher and Higher. Guarantee long lifetime. 5. Waterproof IP67, don't worry the high humidity working environment. Suit for outdoor and indoor planting. 2 Years Warranty. Free repairing. New COB LED Grow Light with New Technology, ensure the light power intensity better than 300W RED&BLUE led grow light. 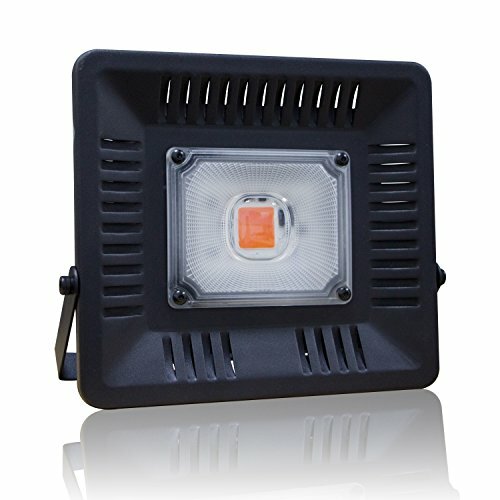 IP67 Waterproof LED Grow light, suitable the high humidity working environment, even raining. Intelligent Control of Heat Dissipation IC inside, ensure temperature less than 65 degrees Celsius. We aim to make you happy with your purchase. However, if you're not completely satisfied, then CONTACT US and we will give you a 100% refund within 90 days of purchase. It is our intention to offer the BEST customer service on Amazon.